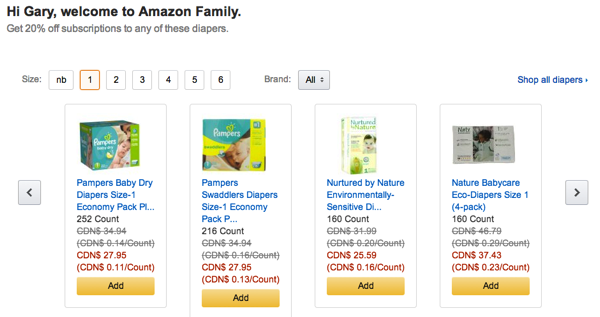 Amazon.ca has launched its Family program in Canada, to bring savings on diaper subscriptions to Canadian families along with unlimited free two-day shipping, as it’s part of the annual $79 Amazon Prime service. 20% off diapers with a Subscribe & Save subscription. Unlimited FREE Two-Day Shipping on millions of items with Amazon Prime, including strollers, high chairs, car seats and more. Access to Amazon Family exclusive discounts and offers on key necessities, including items for the nursery, toys, newborn accessories, children’s books and more. As a new parent, I can’t tell you how incredibly convenient it is to order diapers from my iPhone via the Amazon iOS app and have them arrive at our doorstep in two days. This program looks to make life easier for busy, hopeless, sleep-deprived parents trapped at home like bank robbery hostages in that first month (but it’s all worth it!). Amazon continues to improve its offerings for Canadians, as we now have Amazon Prime, access to the Kindle Fire tablets, and ordering from the iOS app (updated last year). Click here to sign up for a free 30 day trial of the Amazon Family program.